Fu Yu Corp Ltd - Get Paid to Wait? We visited Fu Yu last Monday (7 Jan). Our take is that most of the more easily executable restructuring is completed. Profitable revenue growth will now be the key target over the next three years. Maintain HOLD with a higher target price of S$0.20, based on 0.9x 3-year average P/BV multiple. FU YU CORPORATION LTD (SGX:F13) provides vertically-integrated services for the manufacture of precision plastic components and the fabrication of precision moulds and dies. Since its inception in 1978, the group has grown to become one of the largest manufacturers of high precision plastic parts and moulds in Asia. The group has established a strong presence in the Asian region, with manufacturing facilities located in Singapore, Malaysia and China. Leveraging on its extensive operating history, Fu Yu has built a broad and diversified customer base of blue-chip companies in the printing and imaging, networking and communications, consumer, medical and automotive sectors. To enhance its value-add services to customers and build mutually-beneficial long-term partnerships, the group offers a one-stop solution to customers through its vertically-integrated services. Its comprehensive capabilities range from precision tool design and fabrication and precision injection moulding to secondary processes, such as silk screen printing, ultrasonic welding, heat staking and spray painting, as well as sub-assembly. Fu Yu was listed on the Main Board of the Singapore Exchange (SGX) on 14 Jun 1995. We visited Fu Yu on 7 Jan 2019 for an update. Key findings are highlighted below. In the world of manufacturing, cost reduction efforts, productivity improvements and production yield improvements are some of the most basic key performance indicators. As such, Fu Yu has continuously been striving to manage its cost structure. We believe the bulk of Fu Yu’s restructuring efforts has been completed. Fu Yu had an effective 28.26% stake in Berry Plastics till 27 June 2018 as its 70.64%-owned subsidiary LCTH Corporation Bhd owned 40% of Berry Plastics. With the completion of the privatisation of LCTH, Fu Yu’s effective stake in Berry Plastics has risen to 40%. Berry Plastics’s principal activities are manufacturing and assembly of precision plastic moulded products for the electrical, electronics, healthcare, food and petroleum industries. For 9MFY18, Fu Yu reported a share of loss in Berry Plastics amounting to S$553,000. Withdrawing from this joint venture will be immediately accretive for Fu Yu. Fu Yu currently has five plants in China. These are in Chongqing, Dongguan, Zhuhai, Suzhou and Shanghai. Given the proximity of Suzhou to Shanghai and Dongguan to Zhuhai, Fu Yu could further improve production efficiency and reduce operating costs if it consolidates into one factory each in Suzhou and Dongguan. Of the 5 plants in China, we understand that two are still loss making and one has either turned around or reduced its losses. Fu Yu does not see itself benefitting from the trade war at the moment as it will take some time for supply chains to move out of China. As we understand, most of Fu Yu’s products have yet to be affected by the trade tariffs. Operationally, Fu Yu has also seen inquiries from customers about having production being done outside of China. Other than China, Fu Yu has plants in Malaysia and Singapore. We believe Fu Yu has executed most of the cost side of its restructuring. From FY19 onwards, management will be focusing on revenue growth. In FY18, Fu Yu secured additional projects with existing customers for product upgrades and/or new products as well as new customers. focus on products that have greater stability, longer life cycles and higher growth potential, such as medical, automotive, eco-friendly and smart home consumer products and 3D printers. The key concern currently is the slowdown in economic activities arising from the trade war. Other concerns include price competition as well as the direction of the US dollar versus regional currencies. On customer concentration risk, Fu Yu believes its current customer base is sufficiently diversified. We understand that the top ten customers accounted for an estimated 70% of FY17 revenue while the top five customers accounted for more than 50% of revenue. Based on our channel checks, key customers include HP Inc (HPQ US, Unrated), Verifone (not listed) and Koninklijke Philips N.V. (PHIA NA, Unrated). Typically, the fourth quarter should witness less activity than the third quarter due to the Christmas holidays. We are currently estimating net profit for 4Q18 of S$2.2m, which represents an 8.3% y-o-y decline and a 50% q-o-q decline. faster turnaround in the China operations. We think that, for 1QFY19, Fu Yu has a good chance of delivering y-o-y net profit growth as the reported profit for 1QFY18 was a low S$0.6m. As we understand, the major shareholders have a combined direct stake of 37.53% in Fu Yu and are all more than 60 years old in age. There is no other family involvement in Fu Yu and the three founders own no business other than their interests in Fu Yu. These two factors have led many followers of this stock to believe that Fu Yu is a prime takeover target for either an industry peer or private equity. Given that Fu Yu is back on track in targeting revenue growth, we think that the group will also consider M&A as a way to grow its revenue. As for possible acquirers of Fu Yu, we believe they will need to assess the book value of Fu Yu if any negotiations are to take place. As at end-9MFY18, Fu Yu’s book value per share was S$0.2173. If Fu Yu succeeds in growing revenue profitably over the next few years, its ROE will continue to improve and hence re-rate the share price above book value per share. From Figure 3, we can see that ROEs have been improving. Fu Yu does not have any goodwill or intangible assets on its balance sheet. As at end-Sep 2018, property, plant and equipment accounted for 81.7% of its non-current assets and investment property accounted for 14.8% of non-current assets. Given that land prices have appreciated over the years in Singapore, Malaysia and China, it would be helpful for Fu Yu to engage an independent valuer to provide an updated valuation of its leasehold and investment properties and reveal this in either the FY18 Annual Report or the 4Q18 results announcement. This would give investors a better sense of the company’s up-to-date book value. We believe Fu Yu will be able to exit its Berry Plastics joint venture in FY19 and, hence, we eliminate this S$300,000 loss from our previous FY19F earnings estimate. At the same time, to better reflect the improvement in ROEs due to its restructuring efforts, we switch to the more recent 3-year average historical forward P/BV of 0.9x as our valuation basis (previously we applied the 10-year historical average P/BV of 0.8x). Our target price moves higher to S$0.20 versus S$0.17 previously. We maintain our HOLD call on Fu Yu given its 8% dividend yield. 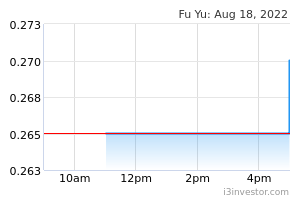 Based on 11 Jan’s closing price of S$0.20, 53% of Fu Yu’s market cap is backed by net cash. As Fu Yu switches its sights to growing revenues, ROEs could improve and hence justify valuations above its cost of equity. We will continue to monitor for signs of new customer/product wins. With the recent proposed acquisition of PCI LIMITED (SGX:P19) by a private equity firm (Platimum Equity), market watchers are also hoping that Fu Yu could similarly attract a buyer. Using the historical 5.2x EV/EBITDA that Platinum Equity is buying PCI Limited at as a guide, this similar benchmark values Fu Yu at S$0.252.